A self-described “Spiritual Impressionist,” Betty Blayton created works featuring layered, aqueous colors and elemental forms that invite viewers to reflect. 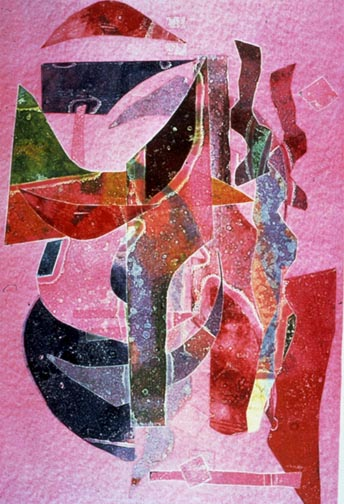 Blayton’s monoprint Idea Waiting to Be Heard (1984) exemplifies her exploratory approach to art as well as her interest in color, texture, and form. Magnetic Fields is the first time that this vibrant work, as well as her monoprint Dream Forms #3 (1984), has been exhibited. Despite growing up in the 1940 and ’50s in then-segregated Williamsburg, Virginia, Blayton pursued her passion for art at the encouragement of her parents. Blayton later became a founding member of the Studio Museum in Harlem in 1968 and the Harlem Children’s Art Carnival in 1969. The impetus for Idea Waiting to Be Heard came from an art project Blayton often assigned to students at the non-profit art center, instructing them to cut out shapes and ink them.